A student newspaper which has been a training ground for a number of veteran journalists is marking its 60th anniversary with an exhibition. The Gown, a student news and features publication at Queen’s University Belfast, published its first edition on 26 April 1955, after being founded by an American student. An exhibition is now being staged at the university to celebrate the milestone, including noteworthy front pages and articles, along with the first edition. Those who previously worked at the paper include former Belfast News Letter editor John Trew and the daily’s former features editor Geoff Hill, along with well-known Northern Ireland journalists Eamonn McCann, Mark Carruthers and Henry McDonald. The Gown’s editor Kylie Noble. The Gown has a print run of around 3,000 for each edition, although the number of editions per year varies, which is expected to be eight for 2015. The commercial paper is staffed entirely by volunteers and is not under the control of the university or the Students’ Union. 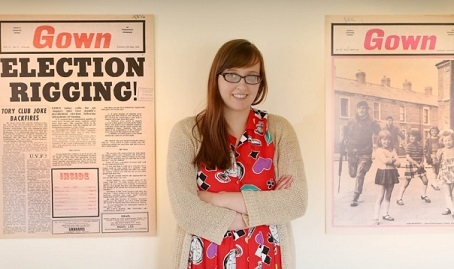 Editor Kylie Noble has worked at the newspaper for three years and said recent hard-hitting stories included a Sinn Fein-instigated referendum on Irish unity among students. She has also made contact with the paper’s founder, Richard Herman, who now lives in Arizona. The exhibition is being held at the Naughton Gallery at the university’s Lanyon building and runs from 15 April until 3 May.